In the next few minutes a marathon is kicking off in the aid of the Malta Hospice Movement. This is an event happening during the next three days. There are 43 music acts participating in this, mostly rock bands however there’s a mix of pop, some metal, as well as music with Maltese lyrics. Some of the bands are new to the scene and are even performing for the first time in public, but it’s all guaranteed to be fun, especially for such a good cause! The entrance is a donation of 10 euro for the three days. The marathon is taking place in the limits of Mosta at the ‘Razzett l-Ahmar’. One can buy drinks and make a day out of it! The venue has both an inside and out door area, but since today is rather cold, the organisers decided to move everything indoors which offers a cosier environment. 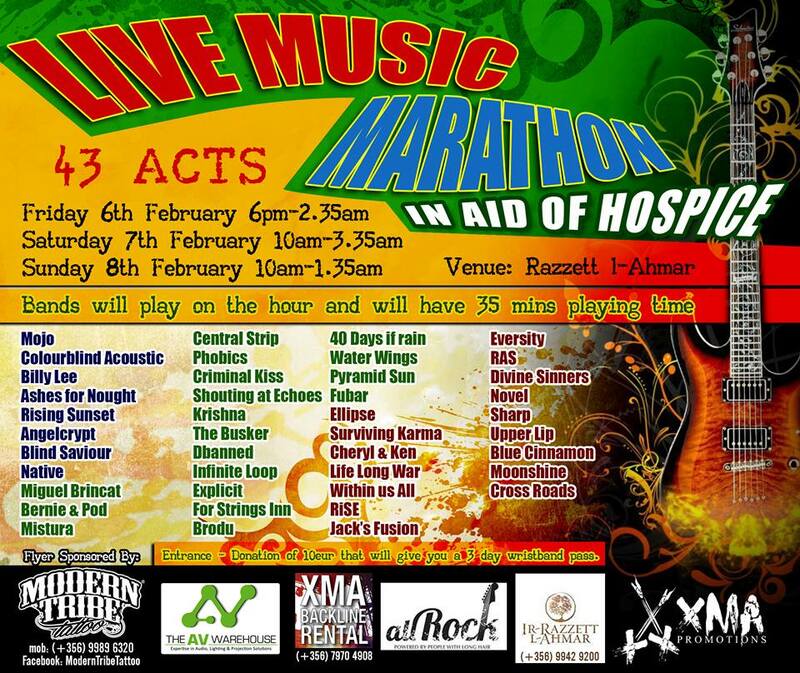 Bands will play on the hour and will have 35 mins playing time, leaving 25 mins for a change over.